The bill Democrats will introduce would limit magazines, belts, drums, feed strips and “similar device[s]” to 10 rounds of ammunition. It would allow people to hold on to the “large capacity ammunition feeding device[s]” that they currently own, but prohibit them from buying others or transferring the ones they have. The full story over at Huff Post. 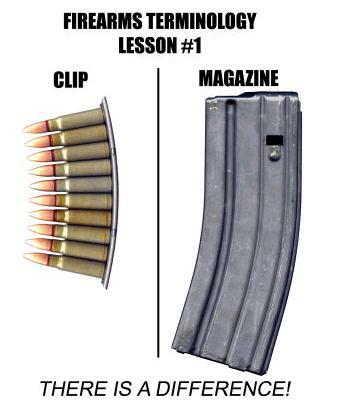 Is it just my imagination, or are a lot of people actually now correctly calling magazines “magazines”… not “clips”? they are covering the bases and calling them magazine clips. for all its left leaning, huff post does at least like to get terminology right. Shut up. They might read this blog, see you comment, and then the Serialized Magazine Retrofit Bill will be introduced. If a firearm were designed to feed loose ammo by gravity, would your hand be considered a “similar device” ? just hold your gun upside down and have a hopper is what you are thinking? I like it! Someone try this and post on youtube. Libs hate to be made to look stupid. They catch on after a bit. Stupid as they are.